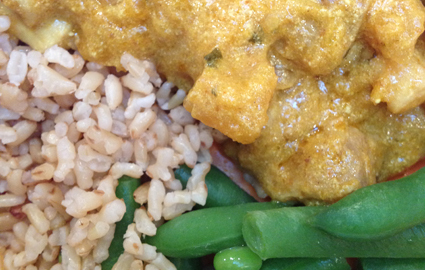 The kids love this korma recipe and it’s a great way to start introducing stronger curry flavours to our fussy eaters. The pumpkin breaks down and makes the sauce thick and creamy and adds even more sweetness to the already sweet korma curry. Heat pan on low heat. Add oil, then onion. Stir then put the lid on and cool gently for 5 mins until the onion is translucent. Slow cooking equals sweet onion. Chop chicken and increase pan heat. Move onion to one side and add chicken, stirring to seal and brown the chicken. Add diced pumpkin and stir through . Add Korma paste and cook on a medium heat until fragrant. About 3 mins. Now add water, bring to boil and then turn heat low, replace lid and gently simmer for 10 mins. Mix through sour cream (or just cream will do) and serve with steamed rice and green beans. Melbourne based journalist/interactive producer who loves to cook .. and eat. This entry was posted in Chicken, family, Main Meals and tagged chicken, comfort food, easy, family friendly, pumpkin, recipe. Bookmark the permalink.